It is a fish many grow up fishing for, an "easy" catch to get kids hooked, in our province there are very few places to go to catch one and we are the most northern range. 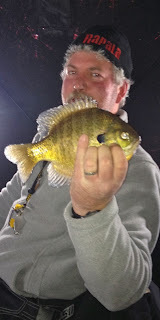 I had been interested in bluegills for a while now, what is a common fish in most states is very rare here. 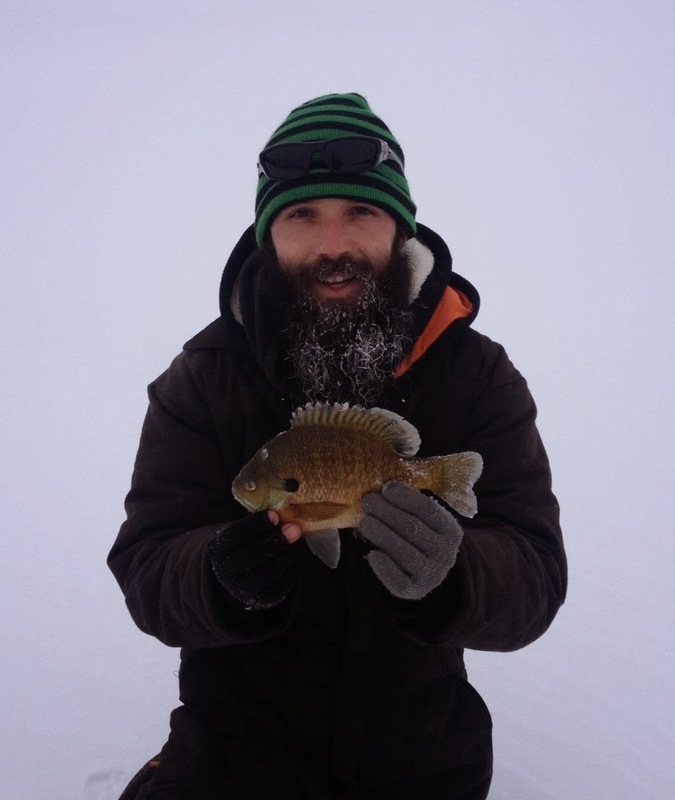 Panfish has appealed to me greatly since my first successful outing, ultra lite gear, with lite line and small jigs, the fight and action can be quite memorable. After hours on end this summer trying for them on a river and catching everything but, I was off with two friends to a different location to try my luck on the hard water. We arrived later than I would have liked but I can't complain, none of us had fished this body of water before and there was still plenty of daylight. Out on the ice with some holes drilled, sonar down and lines in the water, the fish were hugging tight to the bottom and my first few offerings got sniffers but no takers. It was good to know our first location was on top of fish, but I needed a bite. I changed up to a short shanked very small jig head and tipped it with a chunk of scented plastic that had done me very well with all sorts of species over the years and it wasn't long before the tip of my rod bent and I set the hook. A quick but exhilarating fight followed and up came my first ever bluegill at 9 inches and I was beside myself. 7 inches and up is classified as trophy in our province, the record being 11.5 inches. Such a weight had been lifted off my shoulders, a species I had wanted for so long and I finally got to see one and land it. Cloudy skies and no wind we kept fishing and I landed two more 9 inch gills, followed by my fishing partners each landing a nice one. The action continued with my personal best of the day a 9.25 inch gill and some smaller ones over 8 inches. We decided we were on the fish and knew the wind was to pick up by noon, so we set up the six person shelter and continued fishing in the warmth and out of the wind. The action slowed for a while as we tried other lures and baits, I was shocked that they were not interested in multiple kinds of fake waxies. The colour schemes and scents that they would commit to were very specific it seemed, as well the bite would heat up and die down often. As the sky cleared and wind picked up the bite had really died down, we took this opportunity to dead stick and eat some food. 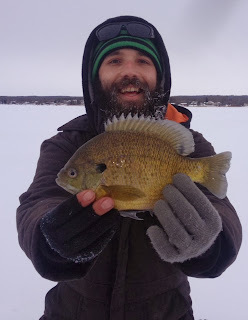 After a lul in the action and a tiny pike landed, Jeff beside me hooked into a 10.5 inch pie plate of a bluegill, followed by a few more 9 inchers within 5 minutes. I had missed a few bites and switched back to my faithful scent and waited it out. As the afternoon wore on, the fish got hungry again and the fun picked up. 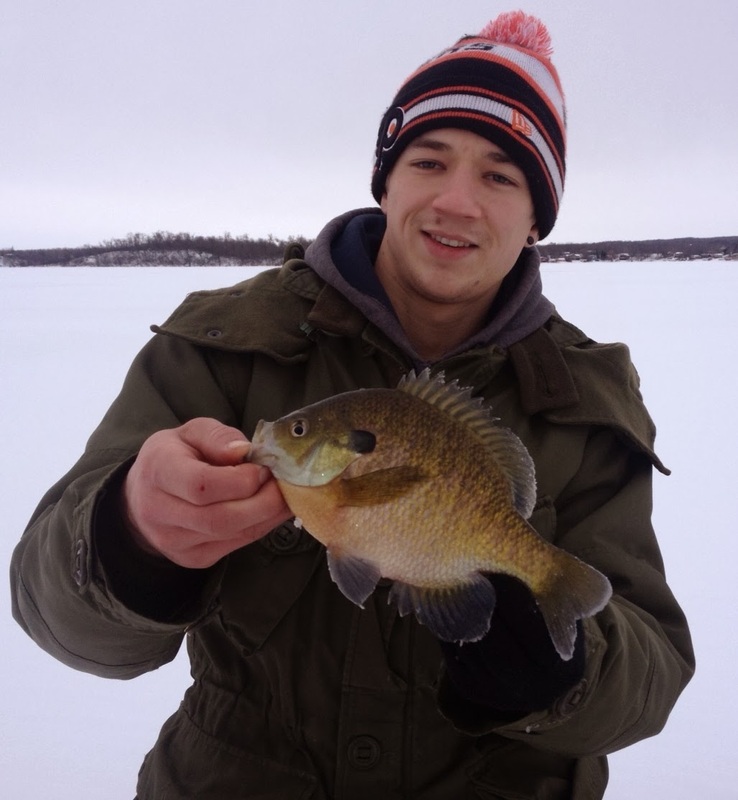 Many double headers and a few fish lost on the bottom of the ice. The fight in these feisty little bluegills was more than I expected, I can really see why these are a favorite of so many. With the sun setting we wanted to stay but had to start packing. It was hard to turn off the flasher and power down the heater, but we had all been rewarded not a fish under 8 inches. I plan on going back sooner than later, maybe even tomorrow.